Stunning conditions yet again today in Argentario for the final day of racing at the Rolex Swan 45 World Championships in Cala Galera (Argentario), organised by the Yacht Club Italiano and the Circolo Nautico e della Vela dell’Argentario in partnership with Rolex. Blue skies and 10-12 knots of wind greeted the teams on the last day of the Rolex Swan 45 Worlds. You could feel the intensity on the water with two general recalls and a third of the fleet black-flagged in the final race. Back with a vengeance were FEVER (GBR) and No Limits (NED) who finished first and second in the first race of the day, but this was not sufficient to get the British team on the podium. In race two it was Earlybird out in front again and their first place finish secured them third overall and declared them winners of the Swan 45 Class International Circuit. Meanwhile RW Bol’s No Limits finished second overall with 33.5 points (to win the Swan 45 Class European Circuit), just 3.5 points behind new World Champions Charisma (30 points). This is the fifth edition of the Swan 45 Worlds and the first time that a Corinthian trophy has been awarded. Peter de Ridder’s Swan 45 Checkmate were first in the Corinthian division followed by Iskareen (GER) in second and Mandolino (ITA) in third. With twelve races completed, the teams were quick to credit the Race Committee. 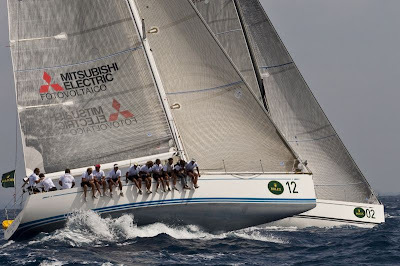 “They were very responsive and set really good courses despite the variable winds,” commented Gabriele Benussi, tactician onboard Jeroboam-Mitsubishi (ITA). “It’s also an optimal result for the Class to have 17 teams here this year,” he added.